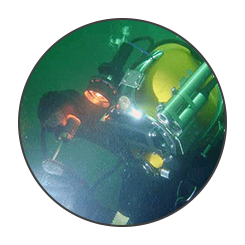 Our licensed commercial divers are available to perform a number of underwater construction and salvage services. We document each step of our process to ensure the overall safety of our crew and to meet all of your expectations with the utmost attention to quality and safety. From Welding and Recovery to Pile Encapsulation and repair, no job is to big or small. Choose quality service with our certified commercial divers. Since 1970, Spears' Diving Service has provided safe and professional commercial diving services to a variety of clients nationwide. We offer underwater welding, maintenance, construction, upgrades, inspections, and repairs to a wide range of customers, including railroad, DOT highway, industrial, marine, and salvage companies. Each of our divers is a certified professional with extensive experience and safety records. All of our operations are fully insured, and meet all government and insurance standards. We bid on local, state, and federal government contracts. A number of government agencies, and private sector industrial complexes have enjoyed the results of our work, both as general contractor and subcontractor. We take pride in delivering superior service while practicing proper safety procedures. Our divers have performed certified inspections and repairs for large corporations, as well as state and U.S. Government agencies. Located in eastern North Carolina, we are willing to travel to meet any of our clients' needs. We have successfully performed jobs for multiple industries nationwide and look forward to providing you with our same service and diversified capabilities which have made us an industry leader for over 40 years.